Movie-goers, even occasional ones, can not visit New Zealand without experiencing a keen sense of déjà vu. A haunting familiarity overcomes visitors as they explore the sharp-peaked mountains, braided rivers, primeval forests, volcanic mud-pots and plump, emerald hills dotted with snowy sheep. They can’t help but looking for Hobbits. This South Pacific Island nation is the setting for so many recent movies, it’s all but impossible not to recognize some of it. It is the venue for the entire “Lord of the Rings” trilogy, which has gained something of a cult following. “The Hobbit” (in two parts) has its premier in November 2012 in Wellington. Peter Jackson, who produced these wildly successful cinematic feats, lives here in a lovely but modest (by Hollywood standards) house near the coast in Wellington. The mystery persists, however: How did “Rings’ author J.R.R. 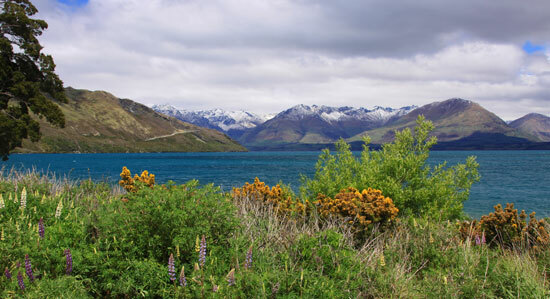 Tolkien so accurately depict New Zealand as Middle Earth when he had never visited the country? “This IS Middle Earth,” says Robin Murphy, who works for Film New Zealand and served as the locations manager for the entire “Lord of the Rings” trilogy. Not only does New Zealand embody a striking diversity of landscapes, it has a quality of pure light that makes filming a delight, she says. It took many months of searching to find just the right locations for each shot – 156 of them are detailed in Brodie’s book, which is indispensible for “Rings” fans who want to search out the film sites for themselves. Murphy found the Alexander farm, not far from the North Island town of Matamata, with its deeply sculpted, intensely green hills as the setting for The Shire – home of the Hobbits. Once “Rings” was filmed, Jackson and company removed every trace and restored the area to its former natural state. But so many tourists kept coming to see The Shire, farmer Alexander asked if the sets could remain after “The Hobbit” was filmed. They will, and can be visited. Long story short, “Ian Alexander is not a farmer any more,” Murphy says. His farm is now a tourist attraction, where visitors can bottle-feed orphaned lambs, watch sheep-shearing and see sheep dogs at work and, of course, take a tour of The Shire. Famer Alexander no longer gets up at 5 a.m. to milk cows. Brodie, who manages the site now, estimates that about 200,000 tourists have come to see Hobbiton, as it’s called, since the ‘Rings’ movies began showing a decade ago. Murphy found the project eye-opening. It’s not just the ‘Rings’ trilogy that has made New Zealand a familiar place to the world. Other movies filmed here, all or in part, include: “Avatar,” “King Kong” (the latest incarnation), “The Lovely Bones,” “Waterhorse,” “The Chronicles of Narnia” (trilogy), “Whale Rider,” “The Piano,” “The Last Samurai” and many more. In fact, a brand new multi-million-dollar film industry has been spawned in New Zealand, providing many jobs, often in new careers. All these films owe something to this burgeoning endeavor. But, of all those movies, it seems that the ‘Rings’ are the big draw for tourists. 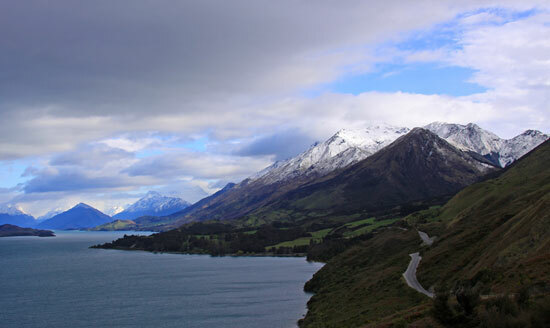 Many scenes were filmed around Queenstown, and the village of Glenorchy, just north of the city, on the South Island. Here, the nation’s signature “braided rivers” (exactly what they sound like) and the steep, sharp peaks that surround the city of Queenstown fit right into Tolkier’s Middle Earth. Get a closer look on a jet boat ride up the Dart River, where the winding and interwoven waterway looks like something a set director might concoct. 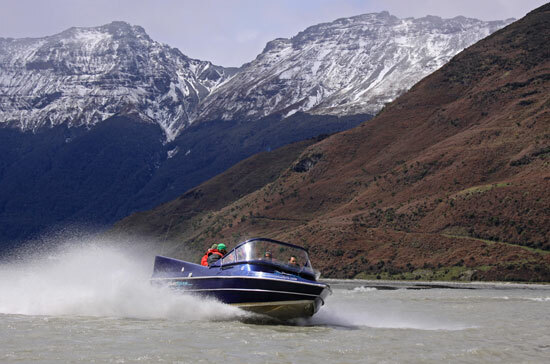 Your guide from Dart River Safaris will point out spots like a range of mountains locally called “The Remarkables,” which became the Misty Peaks of Tolkien’s imagination. Or they might note spots where specific scenes were filmed. Many of their guides actually worked on the films, and can tell personal stories about the experience. Also in this area, you’ll see the setting of (the digitally inserted) Isengard castle and enter an old forest where Merry and Pippin were capturd by Orcs. If you happen to hook up with Nomad Safaris in Queesntown and are lucky enough to get Fran O’Connor as your driver and guide, she’ll not only show you places where filming took place, but also some of the camera tricks used to make the Hobbits seem smaller than Gandalf the Wizard and other characters. As a grand finale to the day tour, Fearless Fran, as some call her, may take her passengers for a plunge in the nearby river, guiding her intrepid Land Rover across it a dozen or more times to give them a bit of a thrill before their day’s journey ends. If she suggests: “Let’s go play in the river!” just nod your head and hang on for dear life. It’s a scream – quite literally. That snorkel tube on the side of the vehicle isn’t just for show! “Rings” fans who visit Wellington need to stop by the WETA Studios, where all the costumes and special effects were created for the trilogy. Here, the repellant ugliness of the Orcs were fashioned, and the character of Smegel (Gollum) was born. It’s a fascinating look at possibly the most single creative spot in the country. Look out, Hollywood. Besides the formation of WETA studios, film tourism has contributed to luring many new visitors to New Zealand, according to surveys done by the nation’s tourism office. More than 90 percent of visitors interviewed in the recent survey said they were aware that many important films had been made in New Zealand. And though most surveyed did not come to the country solely to see “Lord of the Rings” sites, many said they planned to visit some in the course of their stay. Author: Linda DuVal is a freelance writer in Colorado Springs. 1. The scenery. Everywhere you look, it’s beautiful. Even amateur photographers can capture it – the sheer, snowy mountain peaks, the rolling luminescent green hills, the mile-long beaches and more. The forests are primitive and lush with ferns. Cabbage trees (which look like palm trees) sprout up everywhere. The Scotch broom (considered a weed) glows yellow on the cliffsides. 2. The cleanliness. You won’t find a cleaner country on earth. There’s no litter, no trash on the roadsides or on city streets. Public restrooms are tidy and clean. And hotel rooms and restaurants are immaculate. You can drink the water without fear. 3. The food. Yes, everything is expensive here, because most things have to be imported from quite a distance. But try the local stuff. You’ve never had more succulent lamb, more tender beef (they raise a Kobi-like strain called the Speckled Park), and the fresh-caught fish and seafood. Their fish and chips are so wonderful, the English could take a lesson! Seasonally, they have lovely vegetables, too. 4. The people. You’ll not find more gracious and accommodating folk anywhere on the planet. And they like Americans! Boarding a flight from Christchurch to Dunedin, I complimented the Air New Zealand flight attendant on their cute hats. “Oh, do you want it?” she asked, unpinning it! A businessman walking down a street in Wellington stopped to make sure we weren’t lost when we paused to look at a street sign. 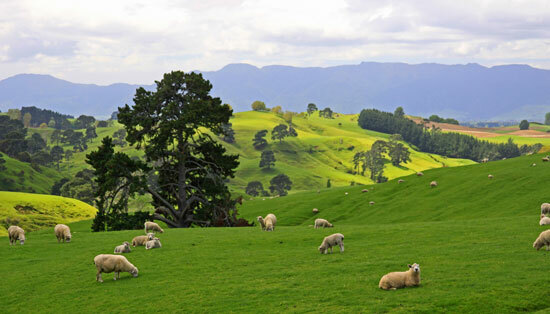 Their genuine warmth and easy sense of humor make any trip to New Zealand memorable. In nearly three weeks, we never met a cranky Kiwi.